Please click on the images to view larger versions. Yesterday afternoon, I spent the day at Skagit Valley, in search of short-eared owls. I found a few, but they were all far away. However, I did manage to get one in-flight image (2nd shot above). It was my first sighting of this majestic creature. Their characteristic deep wing beats, tendency to fly relatively low to the ground, and large wind-span, allow them to be easily spotted from a distance. 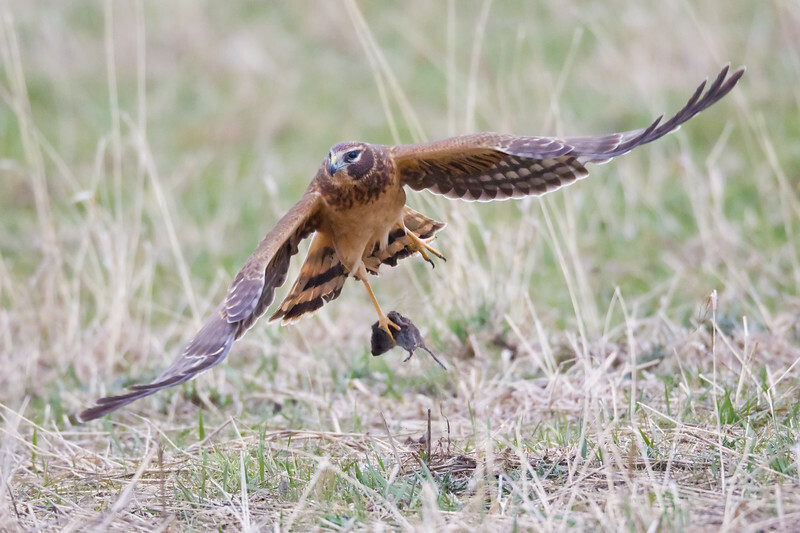 The opening image is of a Harrier Hawk, clutching lunch (a rat) in its talons. I hope you enjoy these! Well well well… look who is using his long glass! Well done man! Nooo… The poor little mousey!!! Haha! Thanks, Conrad. I still have a long way to go before I catch up to you and Tony. I’m seriously considering the new 500mm when it comes out. 800mm is just too long and heavy for most in-flight shots. Now I just have to start saving up. Nicole, natural selection at work. Ann, thanks! I was inspired after seeing the great shots Dileep got over the weekend. I just LOVE the one catching the field mouse! Impeccable timing, Dr. Thapa!!! cool to see the pics. Well worth a full day of waiting!